There's been somewhat of a buzz about this relatively new restaurant. The Coal Shed specialists in meat and fish cooked on their fancy Josper oven - an indoor charcoal barbecue, something of a novelty in the city. It's also no surprise with meat and coal and fire in the mix that The Coal Shed emulates masculinity both in its menu or decor. Think heavy industrial lamps and lots of wood. I like it. The frequently changing menu has the likes of Jacobs Ladder sticky ribs, Steak and Oyster pie, Tartare, Hogget skewers and burgers. They of course have the whole shebang in steaks like Sussex reared Longhorn Cattle and with prices from £14-25, which are probably the priciest steaks in town. As well as a specials board, there is plenty of fish and even a few vegetarian options that span far beyond the mushroom risotto. You generally need to order sides, but these are generous and sensibly priced at just £2. We ate very late and although the starters seemed the most enticing items on the menu, we headed straight for mains. 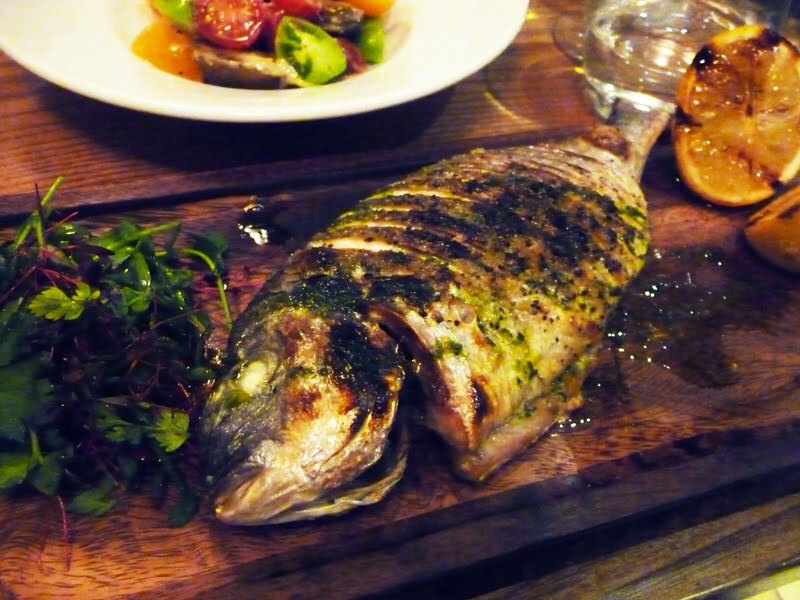 I surprisingly ignored my carnivorous craving and chose the Gurnard Bream £14 from the specials board which arrived simply but beautifully on a board with a micro salad and lemon. I was expecting more of a Barbette flavour to be honest, but the bream was delicate and pillow soft and I wolfed down all of the crispy skin, something I never ever do. 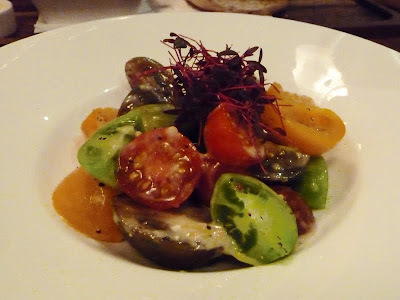 The Heritage Tomato salad I washed it down with was divine. 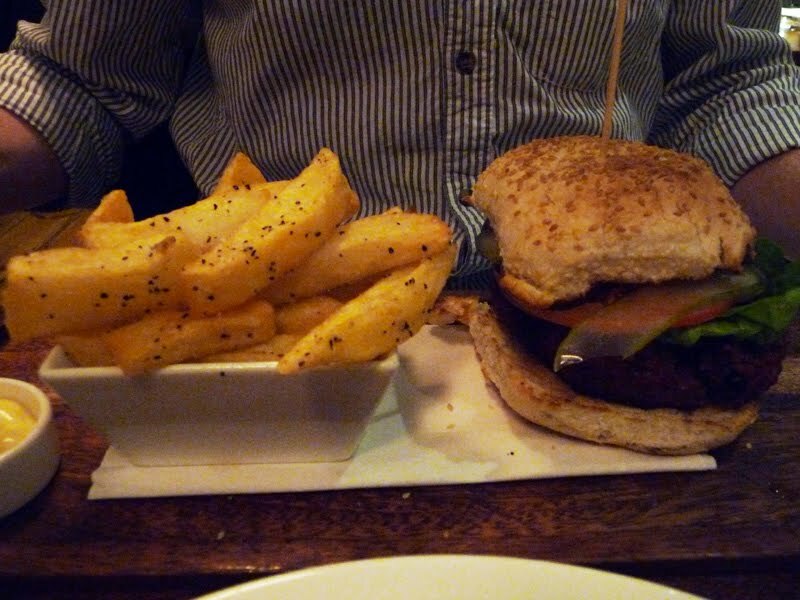 Mr. GF also chose from the specials and went for the Venison Burger with Juniper berries, £8.50. Served medium rare this looked really good. Surprisingly the juniper berries were whole and plentiful, so quite prominent in the burger if you crunched one under your tooth. Chips were fat and crisp. I personally would have been a little disappointed with the bun, a flimsy sesame example. Wine list is decent and very flexible with most wines available as small or large glass, carafes or full bottle options. This I like and liked they had my wine of the moment, the Sicilian Fiano Mandrarossa. Although desserts were tempting we shared a pretty decent cheeseboard, £7 and called it a night. Overall I really liked the style of The Coal Shed and will defiantly be returning for a steak fix and probably a plate or two of the ribs. Although the pricier end for Brighton, the quality of the food seems to be up there. One thing is that the restaurant is quite small and tables even smaller. This is also a bustling restaurant and with so many hard surfaces the noise is quite something - the couple next to us were having an argument and I had no idea for the best part of it!